Used by artists like Coldplay, Drumcell and Ricardo Villalobos, the Station 252 was one of the first cases with power offered by Tiptop Audio in the new Eurorack market. 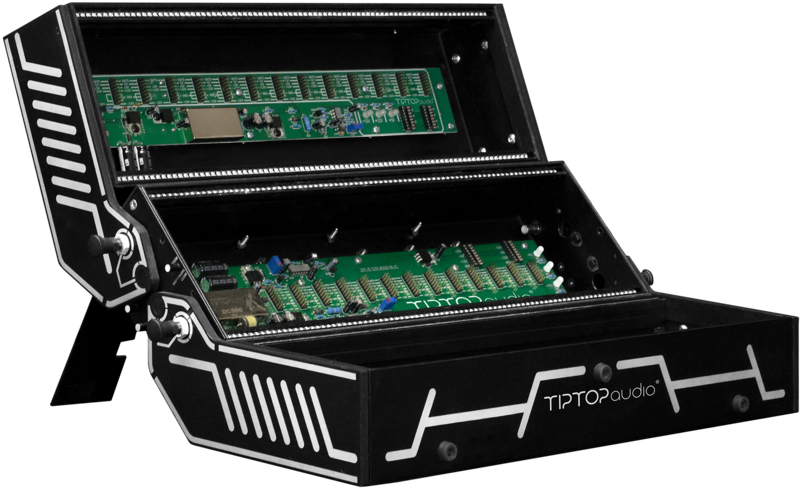 The final Black Widow Station 252 cases are available directly from Tiptop Audio. Station 252 is a portable Eurorack system that tranforms your collection of modules into a distincitve-looking musical instrument that is great for the studio, easy to travel with and powerful on stage. In the studio, Station 252’s ergonomic design provides a natural interface that allows you to work comfortably with your knobs, cables and tactile elements. Traveling is a breeze; it folds down and is ready to go in less than a minute and it’s easy to carry in one hand, even when completely filled with modules. It was made to fit in an airplane overhead bin and provides the convenience of a universal power supply wherever you go. Under the spotlight, Station 252’s clean, professional design enhances your system’s appearance and seamlessly integrates with your electronic music performance. Station 252 is the product of careful electromechanical engineering. The result is a rack system made of three rows of 84HP for total module space of 252HP that converts into four different position. Constructed from carefully selected lightweight materials, this entire eurorack weighs only 13lbs/5,9kg when empty and is built to last. Station 252 comes equipped with a complete hardwired Zeus Studio Bus power supply system, the world’s only high-power system that can guarantee low noise with minimal bleed-through between modules for a clear sounding synth. This monster power system has a proven records of reliability, safety and performance all around the world. Included are three Zeus Studio Bus boards supplying up to 7200ma of audio grade power to your modules, that is twice more than the previous version of Zeus. Zeus keeps your modules in a cool space, optimizing their performance and extending their lifecycles. The Station 252 can take power anywhere in the world from 100-240Vac. Module Depth: The Station 252 case’s innovative design allows up to 252HP of module space to fit the tight confines of an airplane overhead hand luggage compartment yet still provides module depth for more than 90% of all eurorack modules to fit. The upper and lower section allow for module depth of up to 2,4″ to fit in between the bus board’s power connectors. A 4HP slot of module depth of 2,75″ is located on the right side of both sections. The middle section allows a depth of up to 2″ to fit in between the bus board’s power connectors. Power: Universal power 110-240VAC, 3x Zeus Studio Bus Board, +12V 3900ma, -12V 2400ma, +5V 900ma. Features: Heavy duty handle six rubber feet non-skid strips magnetic kickstand Made of aluminium.